1. MATERIAL: Steel, corrosion-resistant, Type 303 (UNS S30300) in accordance with AMS 5640 (Type 1) or ASTM A 582, or 303SE (UNS S30323) in accordance with AMS 5640 (Type 2), AMS 5738 or ASTM A 582. Steel, corrosion-resistant, Type A286 (UNS S66286) in accordance with AMS 5731, AMS 5734 or AMS 5737. Steel, alloy, Grade 4140 (UNS G41400) in accordance with MIL-S-5626 or Grade 8740 (UNS G87400) in accordance with AMS 6322. Locking Keys: Steel, corrosion-resistant, Type 302 chemical composition of ASTM A 580 only. 2. CADMIUM PLATING AND SURFACE TREATMENT: Corrosion-resistant steel shall be passivated in accordance with QQ-P-35. Alloy steel shall be cadmium plated in accordance with QQ-P-416, Type II, Class 3. The locking keys may or may not be cadmium plated. 3. SURFACE TEXTURE: Machined surfaces shall be in accordance with ANSI/ASME B46.1. 4. HEAT TREATMENT: Alloy steel studs shall be heat treated to 160,000 psi Ftu minimum in accordance with MIL-H-6875. Corrosion-resistant steel studs, Type A286 (AMS 5731, AMS 5734), shall be heat treated to 140,000 psi Ftu minimum. 5. HARDNESS: Alloy steel studs shall have a hardness range of 36-40 HRC. Corrosion-resistant steel studs, Type A286, shall have a hardness range of 29-38 HRC. –	Material:	Dash indicates alloy steel, Grade 4140 or 8740. Add “A” in lieu of dash for CRES, Type A286. Add “C” in lieu of dash for CRES, Type 303 or 303SE. 103	Dash number from Table I or Table II. –	Add “D” in lieu of dash if drilled hole is required. 24	Dash number from Table III. 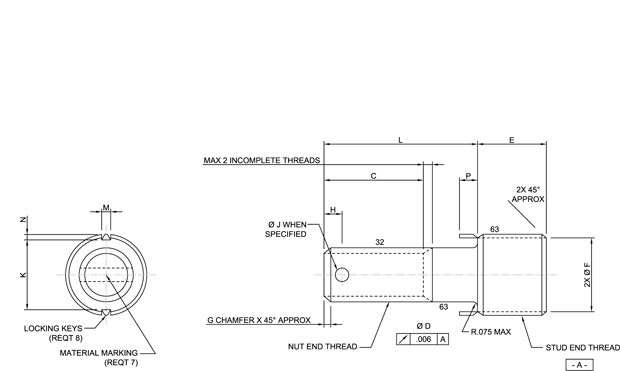 Example:	MS51834A103024 indicates – stud, locked in, key-locked, heavy duty, CRES A286, .250-20 nut end thread, .4375-14 stud end thread, 1.500 length of nut end with drilled hole. 7. MATERIAL MARKING: CRES 303 or 303SE has no identifying mark. CRES A286 shall be identified on top of nut end by one (1) line or dash mark. Alloy steel 4140 or 8740 shall be identified on top of nut end by two (2) parallel lines or dash marks. 8. Studs with nut end thread size .250 and smaller shall be supplied with two (2) locking keys spaced 180° apart. Studs with nut end thread size .3125 and greater shall be supplied with four (4) locking keys spaced 90° apart. 9. Studs shall be free of all hanging burrs and slivers which might become dislodged under usage. 10. SOURCE IDENTIFICATION MARK: Source identification mark shall be in accordance with MIL-S-45915. 11. All dimensions are after cadmium plating or surface treatment. 12. Fillets are R.015 maximum. 2. Installation of studs shall be in accordance with MS51835. 3. In the event of a conflict between the text of this standard and the references cited herein the text of this standard shall take precedence. 8. Referenced government (or non-government) documents of the issue listed in that issue of the Department of Defense index of specifications and standards (DODISS) specified in the solicitation form a part of this standard to the extent specified herein.